The endoskeleton of mammals and teleosts is inherited from their common bony fish (osteichthyan) ancestors (Donoghue, 2006; Maisey, 2000) (Fig. 1). The teleost endoskeleton contains cartilage, bone, and the major categories of skeletal cells: chondroblasts, chondrocytes, osteoblasts, bone lining cells, osteocytes, and osteoclasts (Huysseune, 2000; Witten & Huysseune, 2009). Different from mammals, vertebral body centra have no cartilaginous precursor. Vertebral centra anlagen arise by segmented mineralization of the notochord sheath followed by intramembranous bone formation around the notochord (Arratia, Schultze, & Casciotta, 2001; Huxley, 1859; Kölliker, 1859). In small teleost fish, perichondral bone formation is usually not followed by endochondral bone formation (Fig. 2). Endochondral bone formation occurs, however, in larger species such as in carp (Cyprinus carpio), a close relative of zebrafish (Huysseune, 2000; Witten et al., 2001; Witten, Huysseune, & Hall, 2010). A typical element of the zebrafish endoskeleton consists of a perichondral bone tube with cartilage sticking out as a condyle. Membranous apolamellae can extend from the perichondral bone (Witten & Huysseune, 2007). Inside the medullary cavity, adipose tissue has replaced cartilage, along with nerves, blood vessels, and connective tissue cells. Teleosts have no hematopoietic tissue inside the bone marrow. Hematopoiesis takes place in the head kidney (Witten & Huysseune, 2009). Structurally, bone tissue in teleost fish develops first as woven bone, and subsequently, parallel-fibered and lamellar bone develops. Lamellar bone can also form osteons (Amprino & Godina, 1956; Meunier, 2002; 2011; Moss, 1961), yet not in small fish such as zebrafish or medaka. Compared to mammals, a higher number of skeletal tissue subtypes are recognized in teleosts as part of the regular (nonpathological, nonregenerating) skeleton. Several categories of cartilage are intermediate between connective tissue and cartilage, or bone and cartilage (Fig. 2). The best studied teleost “intermediate skeletal” tissue is chondroid bone, for which different variants exist. Chondroid bone contains chondrocyte-like cells (devoid of cell processes) surrounded by bone-like matrix (Huysseune, 1986; Huysseune & Sire, 1990; Huysseune & Verraes, 1990). In addition, secondary cartilage and chondroid tissues can develop on cranial dermal bones (Benjamin, 1990; Beresford, 1993; Hall & Witten, 2007; Witten et al., 2010). Figure 2. Types of differentiated cartilage and cartilaginous tissues in teleost fish modified after Witten et al. (2010). Typical hyaline cartilage (A) is one of many cartilage types. 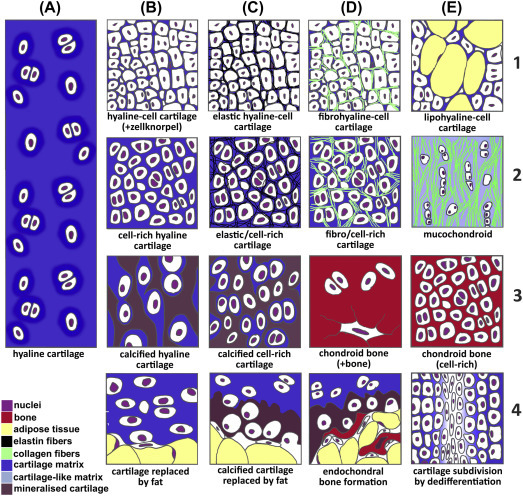 Cell cartilage (B1) and cell-rich cartilage (B2), characterized by a reduced amount of matrix, are common. Hyaline-cell cartilage can intermingle with adipose tissue (E1). Cell-rich cartilages can contain additional fibers made from elastin (C1,2) or collagen type one (D1,2). Hyaline and cell-rich cartilage can permanently mineralize (B3, C3). Different types of chondroid bone (chondrocytes embedded in bone matrix, D3, E3) or chondroid tissues (E2) exist. Endochondral bone formation occurs in large teleost fish (D4). In small teleosts, cartilage is typically replaced by adipose tissue (B4, C4). Cartilage elements can subdivide by dedifferentiation into fibroblasts (E4) (Dewit, Witten, & Huysseune, 2011). In vivo there is a continuum of cartilaginous tissues and cells can have intermediate characters between connective tissue and cartilage, or between cartilage and bone (Hall & Witten, 2007). Beresford (1981) and Hall (2015) also describe intermediate skeletal cells and tissues in mammals. The second component of the endoskeleton is derived from a variable number of cartilaginous pharyngeal (visceral) arches, which develop in the floor and walls of the pharynx and are formed by the gradual migration of neural crest cells. Each arch contains epithelial covered ectoderm and endoderm as well as mesenchyme originating from the neural crest. In aquatic forms, they support the gills, but their function and subsequent development varies in different groups of land animals. In early jawed vertebrates, the first two arches were involved in the formation and support of the jaws, but in higher vertebrates they became incorporated into the skull, ear and skeleton of the neck. For instance, Meckel’s cartilage is a prominent but transient structure from the lower element of the first (mandibular) arch seen in the embryos of all mammals. Reichert’s cartilage, from the second (hyoid) arch, contributes to the temporal and hyoid bones, and parts of the posthyoid arches form the larynx. With development of more rigid exo- and endoskeletons, the auxiliary role played by compression of the hydrostatic skeleton gradually lost effectiveness, and animals may have been selected for the development of a circulatory system based on the propulsion of intravascular fluid by specialized pumping organs. In other words, this was a critical transition from a fluid transport system that relied on coelomic micropumps and bodily movements, to a system driven by macropumps (Fig. 3C). In summary, this hypothesis proposes that the basic foundation which all pumping organs were built over was the organization of a layer of contractile myoepithelial or myocyte cells derived from the coelomic epithelium that lined primitive vessels. Therefore, the birth of the first specialized pumping organ coincided with the creation of a myoepithelial or muscular cell type, whose sheets enveloped the external walls of blood vascular channels, thus forming the ancestral peristaltic pump (Ruppert, 1997; see also Chapter 8.1). This view is consistent with the ventral origins of vertebrate pumping organs, the dorsal origins of arthropod vessels and the ventral, dorsal and commissural origins of annelid pumps (Martin, 1980; Milne-Edwards, 1982) (Fig. 3C). Resorption as well as deposition occurs in the endoskeleton. Possibly the earliest demonstration of this was in cidaroid spines (Prouho 1887), which grow and stop when the spine is an appropriate size for the size of the associated tubercle and over-all size of the test. When a cidaroid spine stops growing, the dermis dies and usually the surface becomes covered with fouling organisms except for a small collar immediately above the milled ring, which remains covered by an epidermis. The problem in growth is that small individuals of a cidarid species have fouled spines yet the spines must grow because large individuals have large spines. The solution to the puzzle is that spine growth takes place by shedding and regeneration of the spine tip. The spine breaks above the milled ring near the junction with the tip that lacks epidermis. A new tip grows to a larger size before growth stops and the epidermis again dies. Shedding the spine tip involves dissolution of calcite in the collar along what is now called Prouho's membrane. The cellular processes associated with activity within Prouho's membrane have been described by Märkel and Roser (1983a,b). Resorption of calcite appears to be a general phenomenon in echinoids. It has been reported in ossicles of Aristotle's lantern (Märkel 1979), tubercles on test plates of spatangoids (David and Néraudeau 1989), and rods of pedicellariae (Bureau et al. 1991, Dubois and Ghyoot 1995). Other than work on Prouho's membrane (Märkel and Roser 1983a, b) and pedicellariae (Bureau et al. 1991, Dubois and Ghyoot 1995) which directly link cellular activity with resorption, other accounts of resorption are interpretations of aspects of structure that appear to require resorption. Märkel's (1979) analysis of growth of ossicles of Aristotle's lantern for Arbacia lixula and Eucidaris tribuloides shows that the polycrystalline coverings of ossicles as well as the monocrystalline stereom must be resorbed, particularly in the rotulae. Growth and resorption in rotulae also are interesting because the growth center is eventually lost during ontogeny as the youngest plate areas are resorbed. David and Néraudeau (1989) described curious circular marks on the test surface of spatangoids. The marks are not randomly distributed on tests and are distinctive features of species. The best interpretation of these marks is that they form by autotomy of tubercles and associated spines, which is a process that would require calcite resorption to undercut tubercles. In this respect the process would be more comparable to the formation of Prouho's membrane than to the reshaping of ossicles in Aristotle's lantern. Resorption of calcite in response to starvation or low food has been reported for test size both in the field and in the laboratory. A decrease in test diameter has been reported for Strongylocentrotus purpuratus (Ebert 1967a, 1968; Pearse and Pearse 1975), Heliocidaris erythrogramma (ConsTable 1993), and Diadema antillarum (Levitan 1988, 1989). The magnitude of decrease varies from a few millimeters to 7 mm (Levitan 1989). Small changes of less than a millimeter in ambital diameter could result from tightening of sutures that are relatively open during rapid growth as proposed by Pearse and Pearse (1975) and Constable (1993); no resorption of calcite would be required. Large decreases, on the other hand, would require resorption. The maximum shrinkage shown for Strongylocentrotus purpuratus in Ebert's (1968) study was about 3 mm. In contrast, no statistically significant decrease in test diameter was found in S. purpuratus fed only one day every 8 weeks in the laboratory (Fansler 1983). As the field individuals had some food, it is not probable they would shrink while those starved in the laboratory did not. Reanalysis suggests the negative growth reponed for S. purpuratus in the field resulted from measurement bias (Ebert unpubl.). Neither calcite resorption nor changes in suture size would be required. Measuring a sea urchin accurately is not as easy as measuring a billiard ball. It is a bit of an art because it is necessary to get the jaws of calipers positioned between spines while making sure that the measurement is from the center of an ambulacrum to the opposite interambulacrum and the sea urchin is not tipped. This is particularly a problem with large individuals and with diadematids such as Echinothrix or Diadema spp and so measurements tend to be biased high and the bias increases with increasing size. Errors in measurement also are probable in studies of Strongylocentrotus franciscanus. Smith and Botsford (1998) and Smith et al. (1998) showed growth increment data that indicate negative values as large as 5 mm over a period of 23 days although most increments were positive. The authors provided an estimate of measurement error equal to about 2%, which for a 6 cm animal would be about 1.2 mm. Kalvass et al. (1998) showed 8 negative increments out of 38 measurements of tagged S. franciscanus. The largest negative increment was about 2.5 mm over a period of 111 days. The same individual showed negative growth of about 4 mm over 205 days. As the sea urchins were well fed and gonads increased in size the authors attributed the decrease to be measurement error. Measurement errors may seem trivial but changes of just a few millimeters have been reported as evidence of shrinkage (e.g. Ebert 1967a, 1968; Levitan 1988, 1989). Errors also can influence choice of a growth model and variance of parameter estimates. There also are consequences for the selection of a tagging method because growth less than measurement error will not be detected. Methods that can detect real changes in size must be used. The changes in diameter for Strongylocentrotus purpuratus (Pearse and Pearse 1975, Ebert unpubl. ), Heliocidaris erythrogramma (ConsTable 1993), and Diadema setosum (Ebert unpubl.) all suggest that shrinkage of suture spaces coupled with measurement errors are sufficient to account for negative growth. Resorption as well as deposition occurs in the endoskeleton. Possibly the earliest demonstration of this was in cidaroid spines (Prouho, 1887), which grow and stop when the spine is at a size determined by the associated tubercle and overall size of the test. When a cidaroid spine stops growing, the dermis dies except for a small collar immediately above the milled ring, which remains covered. The problem in growth is that a spine with a dead dermis cannot have another growth episode and grow to a larger size. The solution to the puzzle is that spine growth takes place by shedding and regeneration. The spine breaks above the milled ring near the junction with the tip that lacks epidermis. A new tip grows to a larger size before growth stops and the epidermis again dies. Shedding of a cidaroid spine, however, may not always require that the dermis first dies. Cutress (1965) described typical primary ambital spines regenerating as flatter oral spines during body growth as plates were moved below the ambitus; dermal death may not have preceded loss and regeneration. Shedding the spine involves dissolution of calcite in the collar, along what is now called Prouho's membrane. The cellular processes associated with activity within Prouho's membrane have been described by Märkel and Roser (1983a, b). Resorption of calcite appears to be a general phenomenon in echinoids. It has been reported in ossicles of Aristotle's lantern (Märkel, 1979), tubercles on test plates of spatangoids (David and Néraudeau, 1989), and rods of pedicellariae (Bureau et al., 1991; Dubois and Ghyoot, 1995; Dubois and Ameye, 2001). Other than work on Prouho's membrane (Märkel and Roser, 1983a, b) and pedicellariae (Bureau et al., 1991; Ameye and Dubois 1995; Dubois and Ghyoot, 1995) that directly link cellular activity with resorption, other accounts of resorption are interpretations of aspects of structure that appear to require resorption. Märkel's (1979) analysis of growth of ossicles of Aristotle's lantern for Arbacia lixula and Eucidaris tribuloides showed that the polycrystalline coverings of ossicles as well as the monocrystalline stereom must be resorbed, particularly in the rotulae. Growth and resorption in rotulae also are interesting because the growth center is eventually lost during ontogeny as the youngest plate areas are resorbed. David and Néraudeau (1989) described curious circular marks on the test surface of spatangoids. The marks are not randomly distributed on tests and are distinctive features of various species. The best interpretation of these marks is that they form by autotomy of tubercles and associated spines, which is a process that would require calcite resorption to undercut tubercles. In this respect the process would be more comparable to the formation of Prouho's membrane than to the reshaping of ossicles in Aristotle's lantern. Decrease in test size in response to starvation or low food levels has been reported for test size both in the field and in the laboratory and attributed to resorption of calcite. A decrease in test diameter has been reported for S. purpuratus (Ebert, 1967a, 1968; Pearse and Pearse, 1975), Heliocidaris erythrogramma (Constable, 1993), and Diadema antillarum (Levitan, 1988, 1989). The magnitude of decrease varies from a few millimeters to 7 mm (Levitan, 1989). Small changes of less than a millimeter in ambital diameter could result from tightening of sutures that are relatively open during rapid growth, as proposed by Pearse and Pearse (1975) and Constable (1993). No resorption of calcite would be required. Large decreases, on the other hand, would require resorption. The maximum shrinkage shown for S. purpuratus in Ebert's (1968) study was about 3 mm. In contrast, no statistically significant decrease in test diameter was found in S. purpuratus fed only one day every 8 weeks in the laboratory (Fansler, 1983; Ebert, 1996). As the field individuals had some food, it is not probable they would shrink while those starved in the laboratory did not. In 1964, tagging S. purpuratus was performed with nylon monofilament line threaded through the test (Ebert, 1965). Three diameter measurements were made on small sea urchins (≤ 2cm) and all five ambulacral-interambulacral diameters were measured on larger ones. The ambulacrum with the tag showed reduced growth, was identified on data cards for most sea urchins, and so could be removed from analysis of growth (Ebert, 2004). Because of the variation in diameter measurements, the smallest diameter was then selected rather than the mean of the measurements. Making these corrections, however, did not remove obvious negative growth of as much as 3.5 mm (Fig. 7.4A). Negative growth of more that 1 mm, however, did disappear if the initial size measurements in July 1964 were removed from analysis (Fig. 7.4B). Tagging in July 1964 involved a crew with several individuals measuring sea urchins. Measuring a sea urchin accurately is not as easy as measuring a billiard ball. It is a bit of an art because it is necessary to get the jaws of calipers positioned between spines while making sure that the measurement is from the center of an ambulacrum to the opposite interambulacrum and the sea urchin is not tipped. Five measurements that fail to get between spines will result in a mean that is biased high, even though variance may be small. Subsequent measurements where calipers are positioned more carefully will give a smaller size and can lead to an erroneous conclusion that shrinkage occurred. The conclusion by Ebert (2004), based on reanalysis of Ebert (1967a, 1968), was that measurement bias (particularly in July 1964) was the basis of the conclusion that shrinkage had occurred. Neither calcite resorption nor changes in suture size would be required. Errors in measurement also are probable in studies of Strongylocentrotus franciscanus. B. D. Smith and Botsford (1998) and B. D. Smith et al. (1998) showed growth increment data that indicate negative values as large as 5 mm over a period of 23 days, although most increments were positive. The authors provided an estimate of measurement error equal to about 2%, which for a 6 cm animal would be about 1.2 mm. Kalvass et al. (1998) showed eight negative increments out of 38 measurements of tagged S. franciscanus. The largest negative increment was about 2.5 mm over a period of 111 days. The same individual showed negative growth of about 4 mm over 205 days. As the sea urchins were well fed and gonads increased in size, the authors attributed the decrease to measurement error. It would be better, however, to refer the negative growth estimates as due to bias because, with just measurement error, taking a mean of 5 or 10 diameter measurements would provide an unbiased estimate of the true mean. Measurement errors may seem trivial but changes of just a few millimeters have been reported as evidence of test shrinkage (e.g., Ebert, 1967a, 1968; Levitan, 1988, 1989). Errors also can influence choice of a growth model and variance of parameter estimates. There also are consequences for the selection of a tagging method, because growth that is less than measurement error will not be detected. Methods that can detect real changes in size should be used. The changes in diameter for S. purpuratus (Pearse and Pearse, 1975; Ebert, 2004), H. erythrogramma (Constable, 1993), and Diadema setosum (Ebert, unpubl.) all suggest that shrinkage of suture spaces coupled with measurement errors and bias are sufficient to account for negative growth. Echinoderms and vertebrates support their bodies with mineralized exoskeletons and endoskeletons, respectively; therefore they have both left many high-quality fossils. Pikaia is a well-known fossil from the Burgess Shale, representing early traces of cephalochordates (Fig. 3.4C). Recently well-conserved tunicate fossils appeared in the Chengjiang fauna. In addition, soft-bodied hemichordate fossils were discovered. Paleontological evidence supports the emergence of all five deuterostome taxa during the early to middle Cambrian Period, although the evolution of early to modern vertebrates appears to have taken a bit longer. The following are brief descriptions of deuterostome fossils in relation to their evolutionary history. Figure 3.4. Cambrian deuterostome fossils. (A) The stem group echinoderm, Cothurnocystis (From Erwin, D.H., Laflamme, M., Tweedt, S.M., Sperling, E.A., Pisani, D., Peterson, K.J., 2011. The Cambrian conundrum: early divergence and later ecological success in the early history of animals. Science 334, 1091–1097.). (B) Hemichordate acorn-worm fossil, Spartobranchus tenuis (From Caron, J.B., Morris, S.C., Cameron, C.B., 2013. Tubicolous enteropneusts from the Cambrian Period. Nature 495, 503–506.). GB, gill bars; OO, esophageal organ; P, proboscis; PT, posterior trunk; T, trunk; TB, tongue bars. Scale bars represent 2 mm. (C) Pikaia, a fossil (upper) and a drawing (lower) (From various sources.). (D) Tunicate ascidian fossil, Cheungkongella (From Shu, D.G., Chen, L., Han, J., Zhang, X.L., 2001. An early Cambrian tunicate from China. Nature 411, 472–473.). Bt, buccal tentacles; Cs, cloacal siphon; Dt?, presumed degenerating tail; Os, oral siphon; En?, presumed endostyle; Es?, possible esophagus; Ph, pharynx; S?, presumed stomach; St, stem; T, tunic; Tf, tentacle-like fringe; Tfc, trilobite free cheek. Question marks indicate uncertainty. Scale bar, 1 mm. Echinoderms have one of the best fossil records, which has enabled detailed characterizations of their internal and external morphology (Figs. 3.4A and 3.5; Clarkson, 1998; Smith, 2005; Bottjer et al., 2006). The current view of this phylum recognizes five extant classes, only a small fraction of past echinoderm diversity, which included approximately 20 classes in total. Early echinoderms were initially bilateral (see below), and all possessed a water-vascular system with tube feet. A pronounced diversification occurred at the class level during the Ordovician (Paul and Smith, 1984; Fig. 3.5). Figure 3.5. 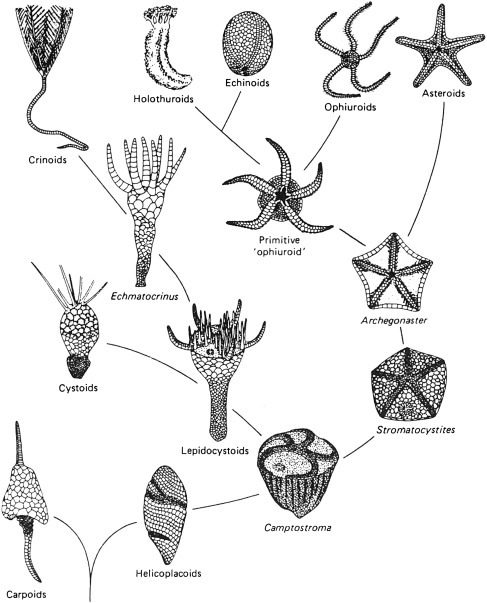 A possible scheme for the relationships of early echinoderms based on fossil records. Given the highly diversified body plans of adult echinoderms, extant animals have so far provided little insight into early origins of deuterostomes; however, their rich fossil record sheds some light on early deuterostome diversification. Some echinoderm fossils have obvious radial symmetry, but many others are strikingly asymmetric and some even show bilateral symmetry, suggestive of early stages in the development of this unusual body plan from a bilateral deuterostome ancestor. One particularly interesting group of asymmetrical fossils comprising mitrates and cornutes also likely possessed gill slits that appear homologous to hemichordate and chordate gill slits, further supporting the pan-deuterostome homology of gill slits. This was discussed in Section 2.3. Hemichordates consist of two major groups: vermiform enteropneusts and minute, colonial, tube-dwelling pterobranchs (Section 1.3). Hemichordate phylogeny has long been problematic, not least because of the conjectural nature of any transitional form that might link the anatomically disparate enteropneusts and pterobranchs. Interrelationships among enteropneusts have also remained controversial. In addition, the hemichordate fossil record is almost entirely restricted to peridermal skeletons of pterobranchs, notably graptolites (Mitchell et al., 2013). Because of their low preservation potential, fossil enteropneusts are exceedingly rare and throw almost no light on either hemichordate phylogeny or the proposed harrimaniid–pterobranch transition. 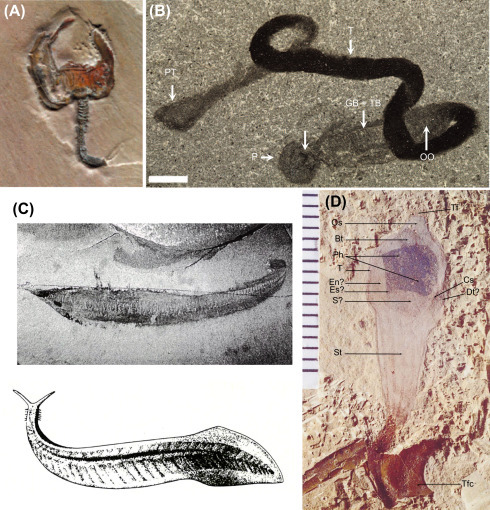 However, a description of soft-bodied fossils of an enteropneust, Spartobranchus tenuis (Walcott, 1911), from the Middle Cambrian Burgess Shale [∼520 million years (MY)] provides some insight into the relationship between enteropneusts and pterobranchs (Fig. 3.4B; Caron et al., 2013). The S. tenuis body is flexible, consisting of a short proboscis; a collar; and a narrow, elongate trunk terminating in a bulbous structure (Fig. 3.4B). The pharyngeal region accounts for approximately 10–20% of the total length. It is wider toward the mouth and tapers posteriorly (Fig. 3.4B). The dorsal branchial pharynx comprises thick and thin bars, interpreted as gill and tongue bars, respectively. Approximately one-quarter of specimens are associated with tubes that have a fibrous composition (see below). S. tenuis is remarkably similar to extant harrimaniids but differs from all known enteropneusts in that it is associated with a fibrous tube that is sometimes branched. It is suggested that this is the precursor of pterobranch periderm and supports the hypothesis that pterobranchs are miniaturized and derived from an enteropneust-like worm. The presence of fossils of enteropneusts and pterobranchs in Middle Cambrian strata suggests that hemichordates originated at the onset of the Cambrian explosion. In addition, the finding that modern Atlantic acorn worms from the deep sea form tubes alternatively suggests that these fossils are similar to modern-day torquaratorids and that some behaviors have been conserved for more than 500 MY (Halanych et al., 2013). The Burgess Shale and Chengjiang sites (Hou et al., 2007; Royal Ontario Museum, 2011) comprise several fossil metazoans that have been referred to as chordates because they show at least some indication of either a segmented body structure, a notochord, or gill slits. Segmentation of body musculature and a gill apparatus are often regarded as the “signature” of the chordates. Notably, this was the case for Pikaia (Fig. 3.4C), from the Burgess Shale, the body of which shows indications of a series of myomeres and a notochord. However, the head of Pikaia bears peculiar appendages (regarded as respiratory organs) and tentacles that have no apparent homology to vertebrate anatomy. Despite the exquisite preservation of numerous specimens of Pikaia, this long iconic “vertebrate ancestor” remains enigmatic. Opinions are still divided as to whether its affinities are to chordates or whether they represent convergent morphology with some protostomes (Conway–Morris and Caron, 2012). In addition to Pikaia, Yunnanozoans (Yunnanozoon and Haikouella) from Chengjiang have also been classified as chordates (Chen et al., 2002a; Shu and Conway–Morris, 2003) because of their presumed notochord, segmented body musculature covered with a cuticle, and their vertebrate-like six pairs of gills. They have been variously considered stem hemichordates, stem cephalochordates, or stem vertebrates. The controversy over the stem-vertebrate and stem-deuterostome hypotheses (Mallat et al., 2003; Shu et al., 2003) reflects the difficulty in assessing the nature of the actual tissues and anatomical characters observed in fossils. Vetulicolans (Vetulicola, Xidazoon, Didazoon, and Pomatrum) from Chengjiang and the somewhat similar Banffia from the Burgess Shale display a bipartite structure, with a balloon-shaped, cuticle-covered head, laterally pierced by five presumed gill openings, and a flattened segmented tail. Again, the vetulicolan gill openings might suggest a stem deuterostome. On the other hand, the purported presence of an endostyle (a gland unique to chordates) suggests stem chordate affinity. Cathaymyrus from Chengjiang was described as “Pikaia-like.” It has a worm-shaped body with a long series of myomeres and a distinct row of closely set pharyngeal slits that resemble those of cephalochordates. However, an interesting speculation is that these fossils demonstrate some features interpreted as intermediate between those of cephalochordates and early vertebrates. New technology including high-resolution X-ray microtomography may disclose additional characters of these fossils, which may link them to extant chordates or enteropneusts. Because of the soft tissues of urochordates, it was once thought that they probably did not leave a fossil record. However, well-preserved fossils from Chengjiang indicate that Cheungkongella (Shu et al., 2001) (Fig. 3.4D) and Shankou clava (Chen et al., 2003) are tunicates. Both show the pharyngeal sac in the midst of the body (Fig. 3.4D). Interestingly, the thick tunic that covers the whole body is evident in both species. This suggests that tunicates had already emerged in the early Cambrian explosion and that they had acquired the tunic before the time of these fossils. However, as a whole, all of these presumed chordates from the Cambrian, preserved mostly as soft-tissue imprints, provide scant information about their possible phylogenetic relationships. It is rather hard to infer the diversification of tunicate anatomy and morphology from fossils, much less their relationships to other cephalochordates and to vertebrates. In all vertebrates, including humans, the calcium phosphate mineralized endoskeleton is not only the basis of species identification, but plays two distinct major roles in this phylum. The skeleton is the scaffold with sites for muscle attachment permitting vertebrates their peculiar stance and mobility, and bones act as storehouses for the elements required for all facets of metabolism (Skinner, 2000). In forensics, or in paleontological studies, distinctive features of each bone or tooth tells its own story of growth, development, aging, trauma, and diagenesis. There are 32 teeth and over 200 bones in an adult human, each a separate organ with its own essential role. These organs are composed of mineralized tissues, composites of bioorganic, and mineral that record the chemistry of what has been ingested (i.e., the C4 or C3 characteristics of the diet) as well as the overabundance of certain, perhaps hazardous cations (e.g., copper) (Pyatt and Grattan, 2001), or shortfall of essential elements (i.e., calcium) that may lead to rickets, usually expressed in the abnormal appearance and function of the long bones. There is at present worldwide concern with personal and public health. Coupling genetic and nutrition information it is possible to discriminate the predisposition, or susceptibility, of some disorders of the vertebrate hard tissues. For example, using animal models the aberrant production of tooth enamel, amelogenesis imperfecta (Dong et al., 2000), is now traceable, and osteoporosis (Avioli, 2000), which may have previously been attributed solely to nutrition or inactivity, is being reexamined in light of molecular genetic predisposition. Mindful that genetic abnormalities are not confined to current populations of humans or animals, a major caveat in evaluating samples for geochemical investigation is to discriminate between “normal” and diseased or “pathologic” tissues. The distribution and composition of the familiar, and common, calcium bioapatite mineral in teeth and bones, relatively easily obtained, is usually extracted from the organic constituents before being examined. Teeth, because of their distinctive forms, functions, and high degree of mineralization, are an important source of samples, while bones present some drawbacks. The background on human mineralized tissues, briefly outlined below, should allow us to make more informed choices for geochemical investigations. Before and during metamorphosis, mesenchymal cells give rise to the fin endoskeleton, with rays growing from proximal to distal. Numerous pathways regulate positioning and outgrowth of these rays and the joints within the rays (Marí-Beffa & Murciano, 2010; Sims, Eble, & Iovine, 2009). Early proximo-distal patterning in the fin bud, largely controlled by Fgf signaling, is thought to establish a “prepattern” for ray positioning. Sonic hedgehog receptors are expressed in the proximal blastema, potentially inducing the differentiation of bone-forming cells (Laforest et al., 1998). Many of these morphogenetic processes are reactivated during fin regeneration (Iovine, 2007), and studying the normal metamorphic processes can lend insight into regenerative processes. Interestingly, fin regeneration in zebrafish is accompanied by enhanced expression of DIO3 and regenerative progress is retarded when DIO3 activity is blocked pharmacologically (Bouzaffour, Rampon, Ramaugé, Courtin, & Vriz, 2010), suggesting that local T3 degradation promotes regeneration. By contrast, growth cone formation of the regenerating lateral line is stimulated by TH (Bouzaffour et al., 2010). Remaining unknown is the extent to which hormonal mediators associated with normal metamorphosis are required during regeneration of other tissues and how precisely these contribute to particular cellular behaviors. The roles of these factors during normal fin development remain largely unknown, but will be interesting to uncover, particularly in light of the diversity of fin morphologies among teleosts more generally. In summary, larval metamorphosis in teleosts involves coordinated morphological changes to many different organs; we now understand only a few of the genetic requirements for these transitions. The mechanisms by which these cascades are hormonally activated and coordinated remain largely unknown. Particularly, considering the growing number of molecular resources for nonmodel organisms (Sarropoulou, Nousdili, Magoulas, & Kotoulas, 2008; Volff, 2005), the genetics of metamorphic events and transitions in teleosts represents a promising field for future study. The gill books of the horseshoe crab, Limulus polyphemus, contain a cartilaginous endoskeleton (Figure 4.1). The scant extracellular matrix contains chondroitin-4-sulphate – which the whelk does not – and reacts as does vertebrate cartilage to histochemical tests for glycosaminoglycans, although a novel sulphated oligosaccharide containing 3-o-sulphated glucuronic acid was isolated from chondroitin sulphate K from Limulus cartilage11. Hydroxyproline and hydroxylysine are present in amounts typical of vertebrate cartilage, and with X-ray diffraction patterns typical of collagen. Lipid and glycogen are found as storage products, whereas cytochrome oxidase indicates potential aerobic metabolism. As with all invertebrate cartilages, gill book cartilages are unmineralised. The presence of lipids, which in vertebrate skeletal tissues play a role in mineralisation, is of interest (see the section on mineralisation below). As gill book chondrocytes divide, a phragmosome-like structure12 – reminiscent of the membrane formed during the division of supporting tissue in plants – is deposited between the daughter cells and provides the basis for new ECM. As the cells mature, the entire chondrocyte is ‘chondrified’; its cytoplasm fills in with matrix products and the cell dies, a process reminiscent of lignification in plants. This unusual pattern of chondrification may explain, in part, the entirely appositional growth of gill book cartilage, which contrasts with interstitial growth of cartilages in other cephalopods (below)13. An endoskeleton is a skeleton found within the interior of the body; it provides structural support and protection for the internal organs and tissues of an organism. Endoskeletons can take several forms, and can differ in complexity, shape and function, depending on the requirements of the animal. Most vertebrates have an endoskeleton, which is comprised of mineralized tissue in the form of bone and cartilage. This ‘true skeleton’ is formed from the mesoderm during embryogenesis. The image shows a diagram of a human endoskeleton with the major bones labeled. Fish within the class chondrichthyes (sharks, rays and chimaeras) have an endoskeleton; although, rather than bone, their skeletons are made up of cartilage, muscle and connective tissues. While the majority of invertebrates have a non-cartilaginous exoskeleton, a select few invertebrates have endoskeletons, including squid and octopus, as well as echinoderms such as starfish and sea urchins. Porifera (sponges) and cnidarians (jellyfish) are invertebrates that have a form of endoskeleton called a hydrostatic skeleton. Instead of bone or cartilage, it consists of a cavity called the coelom, which is filled with a gelatinous substance called mesohyl, and is supported by fluid pressure. While still being lightweight, endoskeletons are also able to support greater body weights than exoskeletons. This enables vertebrate organisms to grow to much larger sizes than those with external skeletons, such as insects. The cortical bone—also called the ‘ compact bone ’— is the dense bone tissue that forms the hard exterior and gives long bones their strength. Compact bone is formed of a calcified matrix containing very few spaces, although it does contain many small cylindrical columns of only a few millimeters wide called lamellae. These lamellae form the osteon or the haversian system. Within the osteon is the haversian canal, the central canal which surrounds blood cells and nerves. Surrounding the haversian canal are the osteocytes, which store the mineral tissue of bones such as calcium. These osteocytes are connected to each other in a network of tiny canals called canaliculi, which allows them to transport minerals, fatty acids and waste and between each other. 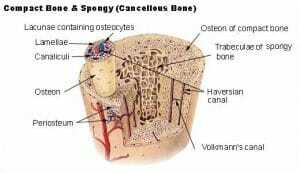 The cancellous bone, also known as trabecular bone or ‘spongy bone’, makes up the interior of the bone structure. Cancellous bone is typically found at the ends of the long bones as well as the rubs, skull, pelvic bones and the vertebrae of the spinal column. It is a lightweight and porous bone with the tissue arranged into a honeycomb-like matrix with large spaces; these spaces are often filled with blood vessels and bone marrow. The main structure of the cancellous bone is formed of thin rod-like bones called trabeculae. The endoskeleton provides the structural support for the body, enabling its owner to stand up; without it, the body would have no shape. Although the skeleton does not necessarily prevent damage to outer organs such as the skin, it provides a great deal of protection for the inner organs. 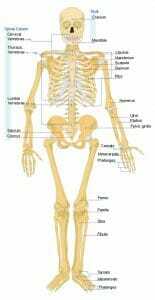 The axial skeleton is the ‘inner skeleton’. This is comprised of the skull, the ribcage and the vertebral column . Its main protective function is for the central nervous system and the vital organs such as the lungs, heart, kidneys and liver. The appendicular skeleton consists of the pelvic girdle, the shoulder blades and arm bones and the legs and feet. This part of the endoskeleton protects and supports the limbs. Bones, when supported by the function of muscles, deliver the capacity of locomotion (movement). The muscles are attached to the bone via tendons or ligaments. Since the structure of bones is mostly rigid, movement of the skeleton is made possible by connecting bones called joints. There are several different types of joint, allowing different ranges of movement. The hip and shoulder have ‘ball and socket’ joints. The ‘ball’ part of the joint is a spherical bone, which fits within the ‘socket’, and can move in almost all directions. The wrist has a ‘condyloid’ joint. This is similar in structure to the ball and socket, and although it has a wide range of movements, it does not allow the wrist to rotate 360-degrees. A ‘saddle’ joint is the joint that allows movement in the thumb. This provides the same range of movements as the condyloid joints although cannot bend backwards. The ‘hinge’ joint is found within the fingers and toes. This allows movement like the hinge of a door—bending in and straightening, although not backwards or sideways. The knee and ankle joints, although hinges, allow a degree of movement when the limb is held in a certain position. A ‘pivot’ joint allows rotational movement. This joint can be found at the elbow, and at the vertebrae directly under the skull allowing the head to move in a rotation. The osteocyte cells—star shaped cells that form a network surrounding the haversian canals—are the cells that are responsible for the maintenance of mature bone. The bone is made up of calcium, phosphorus and other fatty acids, all of which are stored within the osteocytes in the compact bone. When the body is in need of these nutrients, they can be taken from these stores and utilized. Within the cancellous bone is the flexible tissue called bone marrow. There are two types of bone marrow: yellow marrow and red marrow. Within the bone marrow, there are special cells called ‘stem cells’. These are unique in that they have the ability to become any other type of cell. Yellow bone marrow consists primarily of fat, which gives it the yellow color. This fat contains a source of energy that can be used in times of starvation. The yellow marrow contains stem cells called stroma, which can produce fat, cartilage and bone tissue). Red bone marrow—also called myeloid tissue—contains hemopoietic stem cells, which produce an assortment of different blood cells through haematopoiesis. This system typically produces around 500 billion blood cells per day. Some of these blood cells are the red blood cells associated with carrying oxygen around the body, while others, such as lymphocytes, are essential for support of the immune system. The bones of the endoskeleton hold around 99% of the body’s calcium, so they play a key part in the regulation of calcium levels within the body through the process of homeostasis. When blood calcium levels become too high, the hormone calcitonin is released from the thyroid gland . Calcitonin inhibits the osteoclast cells (those responsible for the break down of bone tissue) within the osteon, and stimulates the osteoblast cells (responsible for the building of bone tissue), thus absorbing calcium to the bone and decreasing the calcium levels in the blood. When calcium levels are too high, the thyroid gland releases parathyroid hormone, which acts to inhibit osteoblasts and stimulate osteoclasts, as well as reducing the output of calcium from the kidneys and increasing the amount of calcium absorbed by the small intestine , thereby increasing the blood calcium levels. Exoskeleton – A rigid external skeleton, which acts to protect the soft interior of an animal. Cartilage – A smooth malleable tissue with elastic qualities that forms part of the endoskeleton, or the whole endoskeleton in the case of chondricthyes. Hydrostatic Skeleton – The endoskeleton of certain soft-bodied animals, which consists of fluid-filled cavities rather than bone or cartilage. Notochord – The skeletal rod structure made of cartilage, which supports the body in chordate embryos and some adults. C is correct. The osteocytes are found within the lamellae of the haversian system—the ring like structures which form the dense tissue of the hard cortical bone or ‘compact bone’. 2. Which of the following properties least describes a potential advantage of having an endoskeleton, rather than an exoskeleton? A is correct. Endoskeletons are not necessarily harder than exoskeletons (think a tortoise shell). However, they do allow organisms to grow larger and heavier.